Plastic deformation is a well understood term by scientists, but is nonetheless worthy of a brief explanation. Molten glass behaves in a ductile fashion. It distorts under stress. Plastic deformation is when an object irreversibly changes shape under stress. As the tektite glass cools the plasticity of the glass decreases and a shape is locked-in. With continued cooling the now solidified glass will respond to stress by brittle failure. This is discussed in the subsequent page on spallation. Plastic deformation is commonly considered to have occurred when the indochinite hit the ground. This is not the case. Plastic deformation has taken place not only in proximal indochinites, but also in most medial and at least some (probably all) distal tektites. The time that plastic deformation took place in indochinites can be constrained by the presence of anterior margin bald spots on indochinites. Bald spots are believed to have arisen due to thermal spallation during the late stage of re-entry. The fact that they are only found on the anterior or anterior margin is testimony to the fact that they formed prior to the tektite landing. Plastic deformation must therefore have taken place prior to spallation (or development of spallation surface weakness) and therefore during flight. As discussed in the page on Primary Shapes, plastic deformation in tektites is not without it's critics. One of the more accepted current theories is given by Elkins-Tanton et al. (2003), together with follow-up by Stauffer and Butler (2010). These papers basically ascertain that the 'flattened' tektite morphologies come about by centrifugal forces vs. cohesive forces (surface tension), thus arguing that all flattened morphologies are primary in origin. As per the primary shapes page, this idea is rejected by the author. Instead it is theorised that flattened morphologies are derived from aerodynamic interactions of the molten body with the atmosphere. Shear forces across the anterior margins drive internal vortices, which flatten out the molten tektite. Secondary modification begins as soon as atmospheric interaction with exposure to aerodynamic forces begins, be the tektite molten or solid. Plastic deformation of the molten primary body therefore marks the beginning of secondary modification and usually occurs instantaneously after formation of the primary body. Plastic deformation typically only occurs during the ejection phase, but in the proximal setting, where energies are significantly lower and the tektite does not exit (or only briefly exits) the atmosphere, plastic deformation may continue during re-entry. o The ejection velocity and angle. o The melt viscosity (controlled by temperature and composition). o These, in turn, determine the height of disruption of the melt and solidification point of the tektite glass. If the tektite melt is disrupted within the atmosphere it will cascade into smaller bodies until the cohesive forces (surface tension) of the glass exceeds that of the external stresses. During flight, the tektite is rapidly cooling and therefore melt viscosity and surface tension is increasing. The tektite melt behaves in a similar way to raindrop formation, except that the cooling will lock in a non-equilibrium form (see Figure 8.1). This page will first deal with the distal Australian tektites as these bodies were the first to form after impact. Medial tektites will be discussed, followed by the last formed, lowest energy, proximal indochinites. 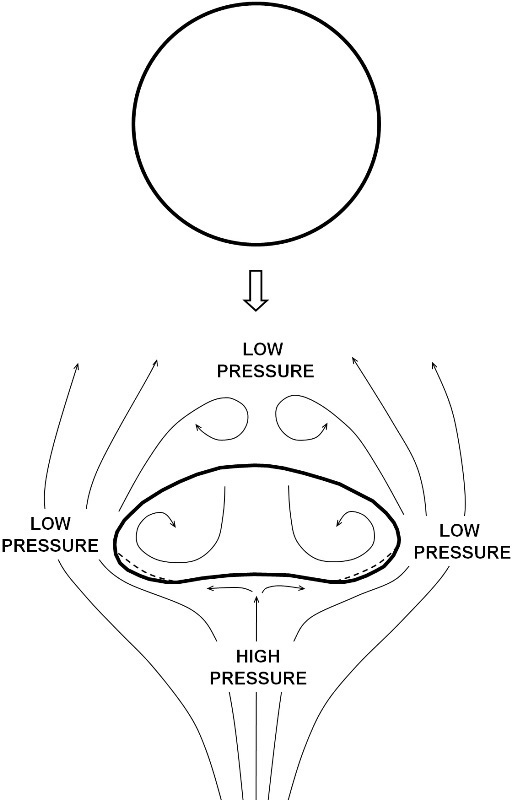 FIGURE 8.1: As external forces exceed surface tensions a large raindrop cascades into smaller raindrops (which may then cascade into even smaller bodies). Cross sectional view is shown and diagram is simplified. Based on image from USGS Water Science for Schools (2013). Distal tektites principally encompass Australian tektites, extending to Java, Indonesia where ablated forms are also recovered. Australites are the most studied of all the tektites and it has been accepted since Fenner (1935) that they formed from cold and brittle, homogenous, perfectly spherical or spheroidal bodies, re-entering at high velocity. The model of perfectly spherical or spheroidal section bodies has been a largely undisputed element in the idea of tektite formation. Herein the author, somewhat controversially, challenges this idea. This idea of a perfectly spherical primary body appears to work in isolation, but in the context of the remainder of the Australasian strewn field problems are identified. Almost all australites are oriented and this requires an explanation. Chapman and Larson (1963), from an analysis of Baker (1956), estimate that 98 percent of australites represent configurations possessing both static and dynamic stability during descending entry into the Earth’s atmosphere. No australites landed as un-oriented spheres, although rare rotationally oriented elongate forms are known. The principal question is: ‘Why are all australites oriented?’ This was a problem identified by Urey (1957). To answer it one must review the medial philippinites, which are discussed in the next section. One notes that the oriented philippinite core morphologies are formed from plastically deformed, flattened, bodies. Un-oriented spheres are also found in the philippinite assemblage. This poses a problem for australites, where it is commonly claimed that practically every single perfect sphere gained a fixed orientation early on during the re-entry process. A percentage of philippinites clearly did not gain a fixed orientation during re-entry and landed as perfect spheres, contradicting this idea. In the distal setting, why do we not see perfectly spherical bodies surviving and landing on the Earth’s surface? Well, one can argue that the re-entry regime differs significantly in distal tektites. Distal tektites re-enter at a higher velocity and lower angle. Consequently they ablate during the first stages of re-entry, whereas philippinites are travelling at insufficient velocity to ablate. It is true that once the body is acted upon to produce some kind of irregularity then a stable orientation would be established. If this is the case then why do we not commonly see evidence of irregularities or re-entry ablation on the posterior surface of australites? Observations indicate that the posterior surfaces of australites have never been exposed to any sort of re-entry modification or heating, except in a few extremely rare rotationally oriented cases, suggesting the orientation has always been fixed. Another way one can image a perfect sphere having a fixed orientation is if it was heterogeneous, containing an off-centre bubble. This is not the case in most small tektites: Bubbles are only rarely developed. A study of the likely ballistic trajectories of tektites might suggest that disruption of the australite melt occurred at a marginally lower atmospheric level than disruption of the melt of medial philippinite tektites, the majority of which were plastically deformed. Some uncertainty does exist in the parameters, but it certainly appears that disruption of the australite melt occurred within the upper reaches of the atmosphere. One must therefore consider how the australite droplet interacted with the atmosphere during the ejection phase. In doing so one must consider that the australite melt was of higher temperature and lower viscosity, when compared to the medial philippinite melt. This low viscosity translates into a tendency to cascade, as resistance to deformation is low. This low viscosity also results in a rapid contraction back to a spherical shape. Numerous assumptions must be made in the ballistic trajectory model, but in order to account for the distribution and morphology of tektites a fairly narrow range of parameters is concluded. Philippinites likely exited at the optimum angle of 30 degrees, travelling at some ~3.8 km/sec. Javaites may have exited at around 20 degrees and ~5.3 km/sec, sufficient velocity for ablation to occur. Australites, representing the first formed tektites, may have exited at around 10-20 degrees and ~6.3 to 6.9 km/sec. When these values are utilised and the time taken to exit the atmosphere is calculated we can observe that distal australites likely took around 15 seconds longer to exit the atmosphere when compared to philippinites. Australites travelled at a higher velocity, but the lower angle of exit meant that the time taken to pass through the atmosphere was greater. Any reduction in velocity as the tektite exited the atmosphere was not factored in. These data make a great deal of sense when one considers observations in australites. The australite melt was the first formed and the highest temperature, lowest viscosity melt. Disruption likely took place in the upper atmosphere, but possibly at a slightly lower atmospheric level when compared to philippinites. More analyses on bubble pressures would be required to confirm this. Due to combined factors of interaction with the atmosphere plus a low viscosity melt, the australites likely cascaded into smaller bodies which rapidly returned to spherical forms. It is envisaged that these bodies were then, just slightly, plastically deformed in exactly the same way as a raindrop is plastically deformed. This result in the bodies being just slightly off-spherical. In the case of australites the atmosphere would have been very much thinner when compared to raindrop formation, but conversely the velocity of the australite is very much greater when compared to that of a raindrop. Even the most miniscule plastic deformation would result in a fixed re-entry orientation for the australite. In order to test the idea of plastic deformation in australites one must return to the specimens and measure sphericity of the primary posterior surfaces. Herein a problem arises in that even in fairly significantly deformed philippinites the evidence of the degree of sphericity is extremely subtle on the remnant posterior surface. The early stages of plastic deformation primarily act on the anterior surface, where the pressure is highest. The posterior surface is under low pressure and is not significantly deformed. Minor flattening would simply give the appearance that the australite originally formed from a larger sphere than it actually did (see Figure 8.2). If you read most of the literature you'd come to the conclusion that, at the point of re-entry, Australites were spherical bodies. This was not the case. Spherical bodies do not readily orient and all Australites are oriented. If you look at some of the larger cores in detail it becomes obvious that they were not originally spheres. This means less ablation and lower velocities than originally calculated. 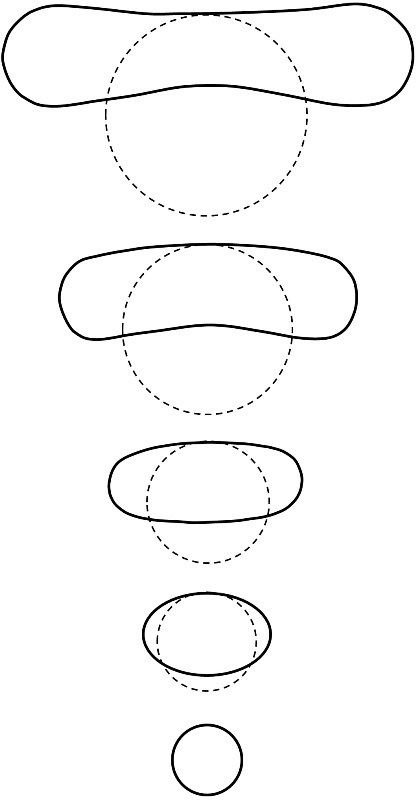 FIGURE 8.2: An impression of how an australite forms from a plastically deformed primary body. Deformation may have been more subtle than depicted. Large dashed line represents the transient primary body. Solid line represents plastically deformed body. Grey area represents australite after ablation. Fine dashed line represents apparent sphericity of the australite. Taken from Whymark (2012). The author measured the sphericity of the posterior surface of many australites, focusing on some of the larger cores in his collection. In agreement with all previous studies, the posterior surface of australites measured appeared to be perfectly spherical. The largest of the australites will likely provide answers about plastic deformation in the distal realm. Large forms will have a longer liquid life, they cool slower, and therefore they are likely to suffer greater plastic deformation when compared to smaller, rapidly quenched, bodies. The author examined photographs of large australites in Fenner (1955), Baker (1962), Chapman (1964), Baker (1969), Baker (1972) and Cleverley (1974). Many specimens appeared to be from spherical forms, but a few did appear to be derived from ellipsoidal, plastically deformed bodies. Without examining the specimens one cannot, however, be certain. A large Javaite in Chapman (1964) also appeared to have a non-spherical posterior surface. Actual studies of sphericity of australites are few and far between. Chapman and Larson (1963) concluded ‘that about 80 per cent of the primary shapes were either spheres or oblate spheroids close to spheres’. Baker (1972) studied a large elongate equatorial core from Victoria, Australia. He reconstructed the primary form and concluded dimensions of 110 x 64 x 56.5 mm for the reconstructed primary form. This is an ellipsoidal cross section. This leads on to the next means of calculating the dimensions of the primary morphology. Disregarding the shield-type cores (to which we will return to shortly), one can study the equatorial cores. This morphology only occurs in ablated forms and the author suspects only from ablated forms that developed a flange. One can be fairly certain that once ablation ceased a relatively thin aerothermal stress shell was lost. If one then assumes a spherical body, the remainder of the missing material must be due to ablation. With reference to smaller bodies one can get a clear idea of the upper and lower limits of ablation that occurred in that region. This leads to the conclusion that some of the larger bodies either suffered very much higher amounts of ablation than smaller bodies, which is hard to envisage, or that the re-entry morphology was an oblate spheroid or ellipsoid. Next we study the lenticular shield core morphology, which is sporadically found in the australite assemblage. It is more common in larger bodies and very much more common as one moves closer to the source crater, i.e. much more common in Western Australia compared with Victoria. In the philippinite assemblages this morphology is associated with the more plastically deformed re-entry bodies. Accordingly, it is assumed that australites displaying this morphology formed from more plastically deformed bodies. This implies that within Australia the least plastically deformed, most spherical, re-entry bodies were the most distal. This may be related to a higher ejection velocity with disruption perhaps occurring at a higher altitude and also due to the higher temperature, lower viscosity, melt. Care should be taken when investigating the amount of ablation in a body. If the above theory is correct then australites suffered less ablation than if they were a spherical body. This might result in a higher re-entry angle or lower re-entry velocity being concluded, most likely the latter. Medial tektites, of which philippinites are the most abundant representatives, are unique amongst Australasian tektites for they exhibit both oriented ‘core’ forms and un-oriented ‘spherical’ forms. It is clear that the spherical bodies, which include large smooth spheres, breadcrust spheres and smaller grooved spheres underwent no plastic deformation either during atmospheric exit or during re-entry. This clearly indicates that these bodies formed at an altitude above which atmospheric effects could deform the molten body. The fact that even the very largest philippinites (1,281.89 grams and 1,194.80 grams) remained almost perfect spheres indicates that all philippinites were sufficiently cooled on the exterior to resist plastic deformation during re-entry. The largest forms were, however, sufficiently hot on the interior to resist brittle crack formation which is commonplace on the smaller breadcrust forms which cooled throughout prior to re-entry. Oriented core morphologies comprise the small lenticular ‘biscuit’ forms (shield cores) and the large ‘hamburger’ forms (bifurcated cores). On casual examination one might conclude that oriented core morphologies formed by spallation of perfect spheres. Detailed sphericity measurements of the posterior surface reveal this not to be the case. Core morphologies clearly exhibit an increase in curvature towards the margins. Initially the author measured deeply etched and water abraded specimens from the Bicol region. It was first assumed that etching and abrasion of the margins resulted in the increase in curvature. Measurements of very well preserved, barely etched and abraded specimens dispelled this idea. Some tektites from Davao region, Mindanao and Sipalay, Negros Occidental region, Negros Island, Philippines had indisputably fresh primary posterior surfaces with sharp margins and these also showed an increase in curvature towards the posterior margin. The implication is clear: The oriented ‘core’ philippinites, which comprise the majority of specimens, were not derived from perfect primary spheres. A sphere is of constant curvature and thus a flattened oblate spheroid or biconvex ellipsoidal morphology is implied (see Figure 8.3). When I started out in tektites I assumed, like many, that Philippinite cores (or biscuits) were spherical bodies prior to re-entry. I then measured thousands of specimens. In fact at the point of re-entry most were significantly flattened, but never to the point of developing a concave posterior or anterior surface. A few specimens were spherical or near-spherical. FIGURE 8.3: The side view of a 67.1 gram (46 mm diameter) indicator core from an unknown locality in the Philippines. This specimen clearly shows the specimen was ‘flattened’ into an ellipsoidal shape prior to re-entry. (Catalogue # PX1117111). One can find further evidence of plastic deformation in philippinites by studying the extremely rare teardrop morphologies. A proportion of these apioids show a clear asymmetry with deformation of the tail (see Figure 8.4). As in indochinites, the tail solidified before the main body and was ‘pushed’ towards the posterior. It is clear that the degree of distortion in no way approaches that of indochinites, but it is very evident nonetheless. These forms exhibit anterior u-grooves (etched cracks) which demonstrate that they re-entered as solid and brittle bodies. FIGURE 8.4: The side view of a 33.9 gram (44x28x25 mm) plastically deformed, then spalled, teardrop from an unknown locality in the Philippines, most likely the Bicol region. (Catalogue # PB1113552). Plastic deformation in philippinites could only have taken place during atmospheric exit and not during re-entry. This can be demonstrated in specimens by the presence of cracks (etched to form u-grooves) on the anterior surfaces of philippinites which imply the glass was brittle during re-entry. It is demonstrated by the fact that even the largest spherical un-oriented morphologies resisted plastic deformation during re-entry. Philippinites probably had a flight time in the order of 7 to 10 minutes and re-entered at velocities of around 3.7 to 4 km/sec (Orbit 1.2 software). It can therefore also be demonstrated mathematically that smaller philippinites would have cooled throughout prior to re-entry (up to around breadcrust size) and larger specimens would have cooled on the exterior, retaining a hot ductile interior, prior to re-entry. It is evident that when indochinites first interacted with the atmosphere they were molten throughout. In fact, it is difficult to differentiate the primary shape formation from the secondary modification because the classic primary shapes were modified as they formed. Rare long teardrop forms informally termed ‘Hershey’s Kisses’ clearly formed by the interaction of a molten teardrop with the atmosphere whilst still travelling with inherited cosmic velocity, and prior to a stable orientation being established. Interestingly, the distortion of molten tektites prove that they formed on a planet with an atmosphere, thus ruling out the Moon as a source. It is a notable that if tektites formed on planetary bodies with a different atmosphere to Earth, e.g. Mars, they would, in detail, be expected to differ morphologically. Historically, it would have been beneficial to have studied indochinite splash-forms in as much detail as ablated australites prior to some authors concluding a lunar origin. For simplicity, a perfectly spherical molten primary body interacting with the atmosphere is used as an example (see Figure 8.5). As the spherical body interacts with the atmosphere it is decelerated. The deceleration force has the effect of flattening out the sphere. Vortices, similar to those found in smoke rings might be expected within the tektite, driven by shear forces as the molten glass flattens out against the atmosphere. The highest pressures are in the middle of the anterior surface and termed a stagnation point (facing the direction of travel). This surface bows inwards, the same as in a raindrop. Often the concave depression on the anterior, termed a punt, is asymmetrical (offset towards one margin), implying a lateral element to the motion. 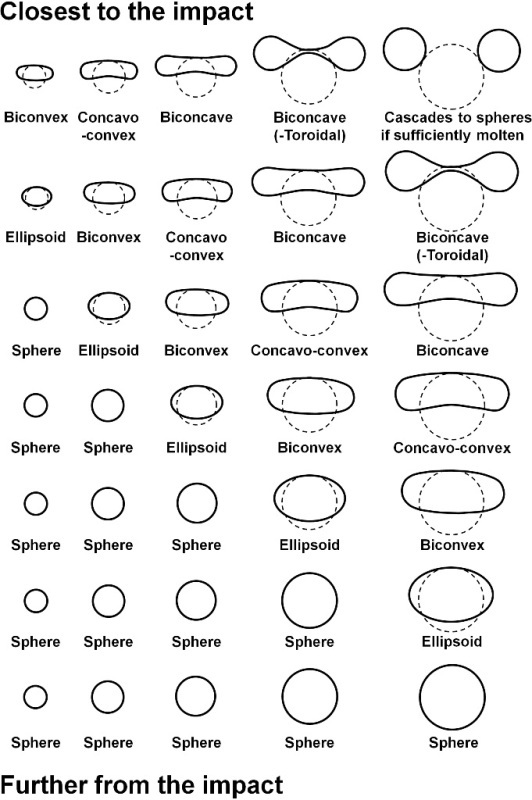 Due to the presence of bald spots on the anterior surface of tektites, it is possible to determine that on a concavo-convex specimen it is usually the anterior surface that has the concavity. This corresponds to high pressures at the stagnation point. Occasionally it has been observed that the concavity may be better developed on the posterior surface. Although not the norm in tektites, this is consistent with some of the experimentation in Baumann et al. (1992) where the indentation begins on the posterior surface and then once the central region is thinned sufficiently anterior pressures indent the anterior, reversing the trend. Due to the deceleration forces the molten tektite literally ‘splats’ against the dense atmosphere. Taken to extremes a biconcave tektite disc forms (see Figure 8.6), but often the tektite solidifies before this morphology develops. Unlike raindrops, basically all tektites are non-equilibrium morphologies as they have solidified prior to equilibrium. Elkins-Tanton et al. (2003) stated that: 'In the absence of cooling, one expects that fluid falling solely under the influence of gravity will result in drops comparable in size to raindrops'. Tektites forming at high velocities under deceleration pressure may in fact cascade to even smaller bodies if they remained molten. The reason why we see large tektites is purely because the exterior cooled rapidly and the body became sufficiently viscous to resist further deformation and fragmentation. The break-up or cascade process is enhanced by the high ejection speeds and low viscosities of molten silicates and retarded by cooling and quenching of the tektite fluid into a glass (Elkins-Tanton et al., 2003). The cascade process is also enhanced by a denser atmosphere resulting in increased external forces acting against cohesive forces (surface tension). Indochinites were flattened by body forces. Indochinites interacted with the atmosphere immediately upon formation. The bodies were effectively flattened by body forces (like when you belly-flop into a pool). Centrifugal forces were not significant - if they were then we would find concave discs in medial and distal settings also, but we never do. In fact the degree of flattening due to atmospheric interaction increases with proximity to the source crater. FIGURE 8.5: A diagram demonstrating the plastic deformation of a molten indochinite sphere into a concavo-convex disc due to interaction with the atmosphere. The line arrows represent the flow of fluids (air and tektite silicate melt). The open arrow indicates direction of travel. The dashed lines represent material later spalled, as the tektite cools, to create bald spots. After Whymark (2009). FIGURE 8.6: A demonstration of how variously sized indochinite spheres will be modified by atmospheric interaction at a fixed distance from the impact. Size is relative, closest to the impact a biconcave disc can be formed from a smaller primary sphere, at distance only a large sphere will form a biconcave disc. At still greater distances a biconcave disc cannot form. The dashed line represents the primary sphere before modification. Onion-form tektites, which form from a molten teardrop, evolved in precisely the same way (see Figure 8.7). In some cases the teardrop forms a disc with only the slightest hint of a teardrop tail showing (see Figure 8.8). The teardrop tail tends to survive as it has a high surface area to volume ratio relative to the body of the teardrop. The tail therefore cools and solidifies early on in the formation process. Proximal to the impact site a viscous low temperature melt has the capacity to form very long, often bubble-rich, extensional teardrop forms. In a runnier melt these would have reverted back to spherical bodies. In forms that have a relatively long tail, the tail, which has solidified early on, is commonly bent or deflected upwards towards the posterior by the dense atmosphere encountered. Due to the fragile nature of the tail, most tails have been broken in the intervening ~788,000 years since their fall. As the tektite interacts with the atmosphere, conductive, as well as radiative, cooling can take place and the tektite is now rapidly solidifying on the exterior surface. A pocket of insulating air is trapped in the anterior concave surface (punt), protecting this distorted primary concave surface for prosperity. The solidified margins of this now concavo-convex tektite are still exposed to the atmosphere. Solidified tektite glass no longer behaves in a ductile plastic fashion: it is now brittle. The next phase of indochinite formation is discussed in the spallation chapter. Figure 8.9 demonstrates a theoretical assemblage would vary with distance from the impact. In close proximity to the impact even the smallest bodies are distorted and the larger bodies cascade or become toroidal to biconcave. At distance from the impact smaller bodies will become increasingly spheroidal and even larger bodies will become spheroidal to ellipsoidal / oblate spheroids. If the body has formed in the atmosphere, as oppose space, then some minor degree of plastic deformation, away from perfectly spheroidal would be anticipated. 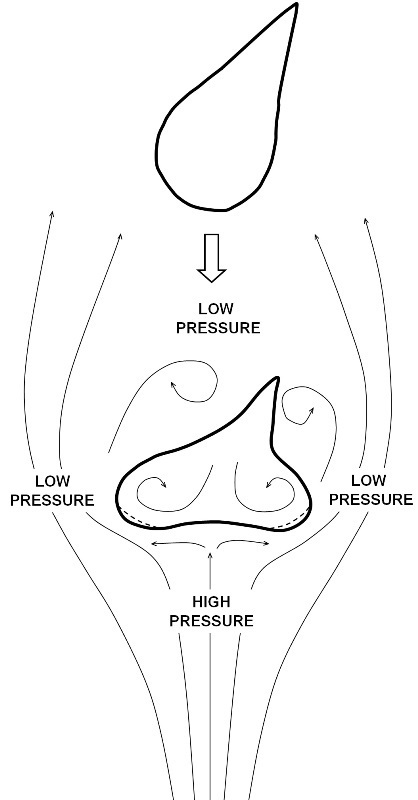 FIGURE 8.7: A diagram demonstrating the plastic deformation of a molten indochinite teardrop into a concavo-convex onion-form due to interaction with the atmosphere. The line arrows represent the flow of fluids (air and tektite silicate melt). The open arrow indicates direction of travel. The dashed lines represent material later spalled, as the tektite cools, to create bald spots. After Whymark (2009). FIGURE 8.8: A demonstration of how variously sized indochinite teardrops will be modified by atmospheric interaction at a fixed distance from the impact. 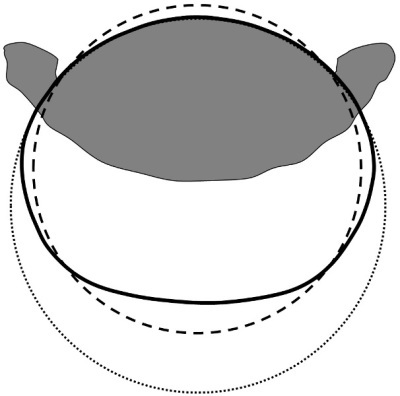 Size is relative, closest to the impact a biconcave teardrop can be formed from a smaller primary teardrop, at distance only a large teardrop will form a biconcave teardrop. At still greater distances a biconcave teardrop cannot form. The dashed line represents the primary teardrop shape before modification. FIGURE 8.9: The theoretical morphology distribution of plastically deformed proximal tektites. The morphology varies with primary size and distance from the impact site. Baker G. 1956. Nirranda strewnfield australites, south-east of Qarrnambool, Western Victoria. Memoirs of the National Museum of Victoria. 20: 59-172. Baker G. 1962. The largest known australite and three smaller specimens from Warralakin, Western Australia. Journal of the Royal Society of Western Australia. 45 (1): 12-17. Baker G. 1969. Five large australites from Victoria Australia, and their relationship to other large forms. Memoirs of the National Museum of Victoria. 29: 53-64. Baker G. 1972. Largest australite from Victoria, Australia. Memoirs of the National Museum of Victoria. 33: 125-130. Chapman D. R., Larson H. K. 1963. On the lunar origin of tektites. Journal of Geophysical Research. 68 (14): 4305-4358. Chapman D. R. 1964a. On the unity and origin of the Australasian tektites. Geochimica et Cosmochimica Acta. 28 (6): 841-880. Cleverly W. H. 1974. Australites of mass greater than 100 grams from Western Australia. Journal of the Royal Society of Western Australia. 57 (3): 68-80. Elkins-Tanton L. T. 2003. A laboratory model of splash-form tektites. Geophysical Research Abstracts 5: 07834. Fenner C. 1935. Australites, Part II. Numbers, form, distribution and origin. Transactions of the Royal Society of South Australia. 59: 125-140. Fenner C. 1955. Australites. Part VI. Some notes on unusually large australites. Transactions of the Royal Society of South Australia. 78: 88-91. Stauffer M. R., Butler S. L. 2010. The shapes of splash-form tektites: Their geometric analysis, classification and mechanics of formation. Earth Moon and Planets. 107 (2): 169. Urey H. C. 1957. Origin of tektites. Nature. 179 (4559): 556-557. Whymark A. 2009. Australasian Tektites: Near and Far. Meteorite Magazine. 15 (4): 28-33.